Well, the cat was out of the bag at Market and, since they've already announced it over at BERNINA's blog We All Sew, I'm so excited to show you "Sundance"! 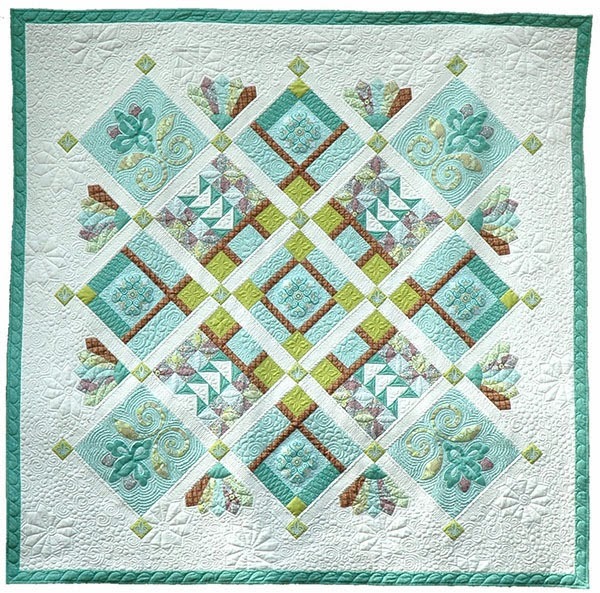 "Sundance" - one of my favorite quilts that I have made. This is a sampler I designed exclusively for BERNINA dealers. (And I've had to keep it a secret all year - that has been so hard!) It has a little piecing, a little embroidery (optional), and a little appliqué. A little bit of everything but nothing too difficult. The piecing forms a grid pattern when you sew the blocks together. 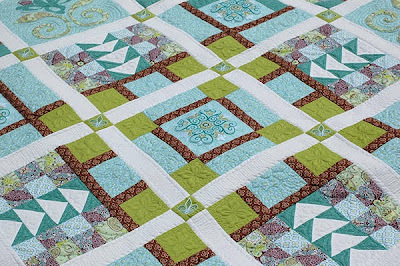 I set the blocks on point to allow lots of open space for quilting! And the quilting - I can't wait to sew another version and quilt it on their new long arm launching in the latter half of 2014! 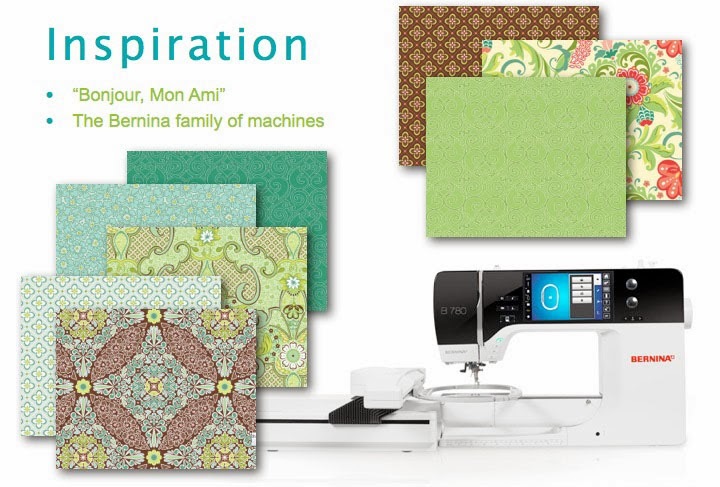 And we will be sharing our designs, from fabric choice all the way through to quilting, through social media and at participating BERNINA dealers. Seriously, I am SOOOO excited to share this quilt with you all because it incorporates so many of the techniques I have learned through the years sewing on BERNINA machines. I mirrored some of the fabric motifs in the quilting. Of course, there HAS to be a Dresden Plate. This piece was really inspired by the BERNINA 780 and by my Bonjour, Mon Ami collection for Blend Fabrics! Sundance will be rolling out with the new year. Check with your local BERNINA dealer to inquire about access to this program. I hope you will sew along with us!!! Absolutely stunning. Takes my breath away! 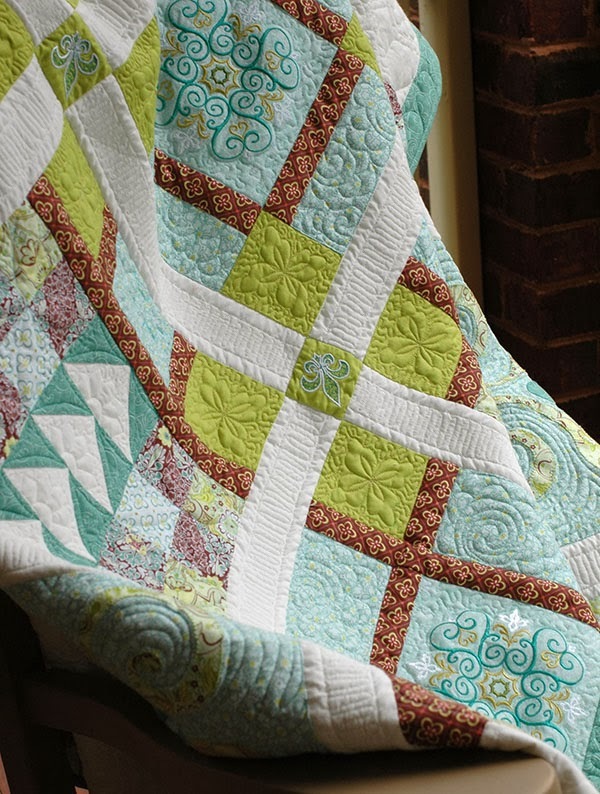 Amazeing fabrics and stunning quilt. 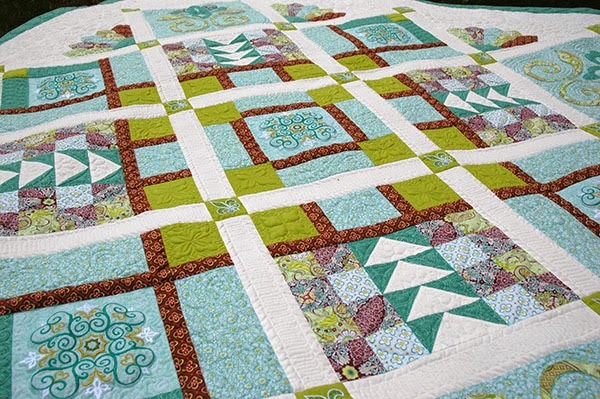 You created a fabulous quilt for sure. It truly is an amazing quilt. Is there any way we can get the pattern over here in the UK? Oh that is beautiful! I would just love to come visit you and you help me with my embroidery. You are truly a master! 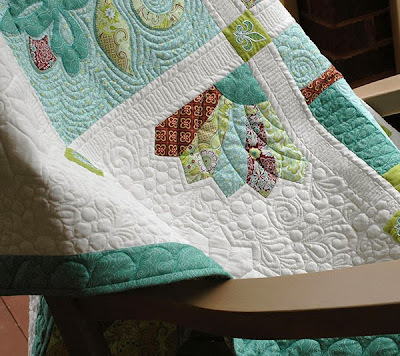 I'm new to this blog after watching Amanda on The Quilt Show. I love your fabrics and designs and have ordered both your books, just waiting for them to arrive. I, too would love to have access to your new BOM, but guess I will have to wait until it is available to all of us.